On Wings of Eagles: Enjoying Your Work. In the secular workaday world, it is commonly said that people who are most successful at their work are the ones who enjoy doing it. There is a good story which can teach us how to have the strongest testimony possible: Many years before he worked his way up to become the head of the General Motors Research Laboratory, Charles Kettering was a foreman of a gang of men who dug holes for telephone poles in Ohio. The true story is told of a hot day at lunchtime when Kettering's gang was approached by a hobo who asked for a bite to eat. Kettering took the man to lunch and filled him up, then asked him if he would like to have a job that would provide him not only with plenty to eat but also a good measure of dignity. The hobo paused, then said he'd give it a try. Kettering gave him some tools and left. 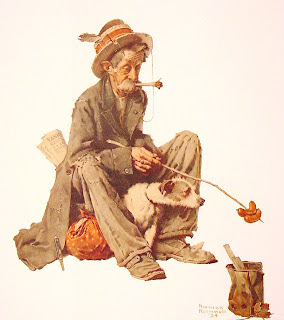 Later when he came back, he found the hobo actually trying but getting frustrated. He only had a ragged hole and his hands were blistered from the effort. Kettering said, "Let me take you over to the best man in our gang. Now here's a man who can dig holes! Look at this hole - smooth, round, with perpendicular walls." Then Kettering himself started digging, saying, "You know, this is really fun. The better you get the more fun it is. Round, smooth holes are a challenge and, well, it's just enjoyable to see how good a job you can do." Kettering left after he had dug a hole. When he came back, the hobo had dug a decent hole. Not only that, he stayed on and became good. Even better than the best guy on the crew! The hobo eventually became foreman of the gang! Later when Kettering stopped by to see him, the ex-hobo said, "You were the first person to tell me that work could be fun! I wish someone would have told me that years ago. I wish I would have been taught earlier how much fun it is when a man tries to do good work! I wouldn’t have been the hobo I was!" Many times an unsaved person is drawn to Christ through watching the testimony of the Christian who really enjoys his life in Christ. The true testimony of a Godly man or women committed to Christ could draw many people who realize that a life given over to God is really fun! He has filled them with skill to do all kinds of work as engravers, designers, embroiderers in blue, purple and scarlet yarn and fine linen, and weavers—all of them skilled workers and designers. Dear Lord we pray that we would enjoy our life in You, so that those that see us will want to have you part of their live also. In Jesus’ name, Amen. Are You Ready to Eat Your Words? What Does Your Reputation Say about You? Are you Thankful For Others? Are You showing Compassion ? Is Your Life a Mixture of Hits and Errors? Are You an Ambassador For Christ? You Can't Just Sit There. Are You Praying for Those in Leadership?